The industry’s first mainstream introduction to Marcus Cole was as the newest lead singer of the male super-group, Commissioned. After a brief hiatus, the Commissioned alumnus is back with his first solo project titled Write My Song, on CeCe Winans’ PureSpring Gospel imprint. This solo debut showcases Cole’s stellar writing ability along with his trademark vocals, making this project one for the ages. Cole delivers an 11-track effort that builds on the foundation of Commissioned while establishing his own dynamic musical indentation. Luther “Mano” Hanes handles the production, putting his signature touch on the offering. Hanes and Cole partner to write the lion's share of the songs, creating a formidable team that blends musical creativity with relevant and transparent lyrics that are guaranteed to strike a chord with all listeners. The heavy hitters show up to be a part of Cole’s solo debut. Maurice Fitzgerald (bass), Bobby Sparks (keys), Darryl Dixon (guitar), and LaDell Abrams (drums) join Hanes, forming an Olympic-like all-star band that carries this project. In addition, Cole collaborates with vocal all-stars, as the legendary Tata Vega and Kayla Parker assist on background vocals. “Finally” features Parker sharing lead vocals with Cole, forging a formidable musical partnership, to say the least. Other amazing songs include “Bless My Soul”, “That’s Alright (Cause I Got You)”, “Persuaded”, and the title track. Also, check out “I Don’t Know”, which sees Cole partner with 2Five, who spit lyrical fire on this track. Not enough can be said about the potency of this effort. Fusing soul and hip-hop with worship-filled lyrics, Cole lets you in to the core of his heart, which is the nucleus of legendary music. 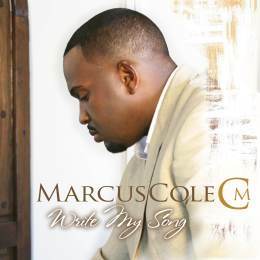 Marcus Cole has a hit on his hands with Write My Song, which deserves a place in any music purist’s collection.